Pederson Point is a Salmon processing plant in Alaska, around the corner and down the beach from Nakneck. I worked at Pederson Point in the early 1970’s when it was mainly a Salmon Cannery. Pederson Point had three Tall can lines and two Half Pound lines, choose any four lines. Here are a couple of pictures from Pederson Point. Joe was Italian and from San Diego, California. Joe had been a fisherman for many years before he was a Port Engineer. Nice guy and very knowledgeable. He had fished and worked with many of the Pederson Point fisherman. Please pardon the dust and data bytes while I try and figure out how to make 25++ Years of Pictures look somewhat coherent. 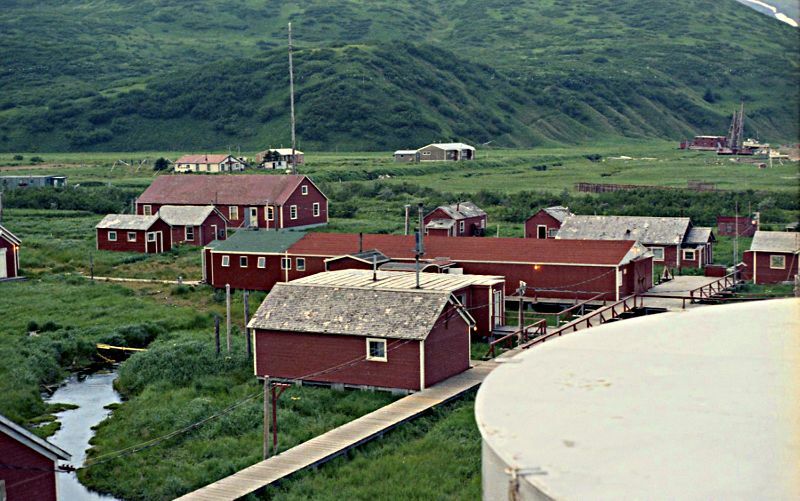 The False Pass, Alaska Cannery was located on the north side of Unimack Island at False Pass. You can look across False Pass to the south end of the Alaska Peninsula. False Pass (Wikipedia), is aptly named as the west end opens up in a wide and inviting waterway that is shallow with a twisty and obscured channel. In 1972 the channel was not marked and local knowledge was needed to transit west of the cannery. The Cannery was built in 1919 by the P.E. Harris, Co. and burned down in the spring of 1981 when a bearing failed in a generator and the rotor dropped down onto the stator while the generator continued to run producing a jet of flames out the bottom of the generator that set the oil soaked creosote floor of the powerhouse on fire. Here are a few Pictures of the False Pass Cannery Buildings.